If the universe were to end and a new universe to be formed afterwards, aliens would be looking for the Ovoid, a mysterious artefact that would allow them to jump into the next universe and, basically, not die. But in order to do that, one would have to find other artefacts, trade, conquer, fight and think very hard to get the life saving device. That is the premise of Chaosmos and that’s what the players have to do it to find a way to locate the aforementioned Ovoid and jump into the next reincarnation of the universe. 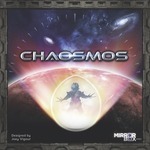 Chaosmos funded in Kickstarter with great success and they unlocked a few stretch goals, so it should be a pretty good game. But, as usual, we have to wonder if the contents of the box are worth the amount of money you have to spend to get your hands on it.